RUDEskis was founded in 2005 when Jens van Kemenade and Bart Kuiper decided that, after just talking about making skis, it was time to actually do it. Combining their knowledge obtained from multiple seasons working as ski-instructors in Austria and New Zealand with insights gained studying for their engineering degrees, machines were designed and built. All of this took place in a first makeshift workshop in a backyard shed in the picturesque Dutch village of Nuenen, known for once being the home of famous painter Vincent van Gogh. All beermat and napkin sketches that were made over the years were combined into the first ski designs and finally, in 2009 the first skis touched the snow. 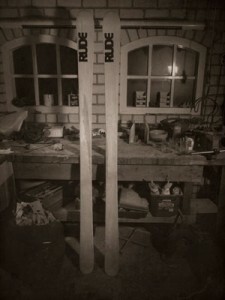 After discovering that the early prototypes were actually great skis, together with the great support and enthusiasm of their friends and families, the dream of starting their own ski company became a reality when in 2010, RUDEskis was officially registered as a company with the Dutch Chamber of Commerce. Because the owners of the backyard shed were not too excited with a full scale ski factory now developing in their garden and because the space was getting too small, the workshop was moved in 2010 to the former mailroom of a derelict government building in The Hague. This new workshop brought forth the opportunity of investing in more, bigger and better machines and more importantly it was heated. Amongst the new machines was a Wintersteiger ski tuning machine to ensure that clients will receive a fully tuned, ready-to-go pair of skis straight from the box.